Give your brand a boost with the sleek and glossy Cafe Tumbler. 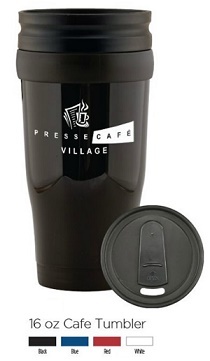 This 16 oz travel mug's BPA Free plastic inner liner helps keep its contents hot or cold for extended periods of time and with the 4-station thumb-slide lid easy access to drink from making it ideal for coffee shops, book stores and gift shops. The high gloss plastic exterior is made complete when decorated with your one color imprint. Call or Text 706-258-7041 for Customer Service, Design Assistance and a FREE Quote. We have many years of experience ready to assist you.